from The Zuni Café Cookbook, pp. 478-79. Whether eaten with coffee at breakfast or wine after a meal, freshly-made biscotti seem like a luxury. Recently, a friend gave me some biscotti she made and I’ve been enjoying them with my coffee and hard-boiled egg that I have most mornings. I got the idea of making my own biscotti to have them on hand, as one more little luxury I treat myself to as a live-alone Solitaire. Now that I’ve tried two recipes, they strike me more than ever like a luxury because they’re trickier to bake than I expected. Either they are too soft or they are too hard. It takes practice to know how biscotti are supposed to feel and look as dough, at the end of the first baking, and at the end of the second. In the photo above, there are two kinds. 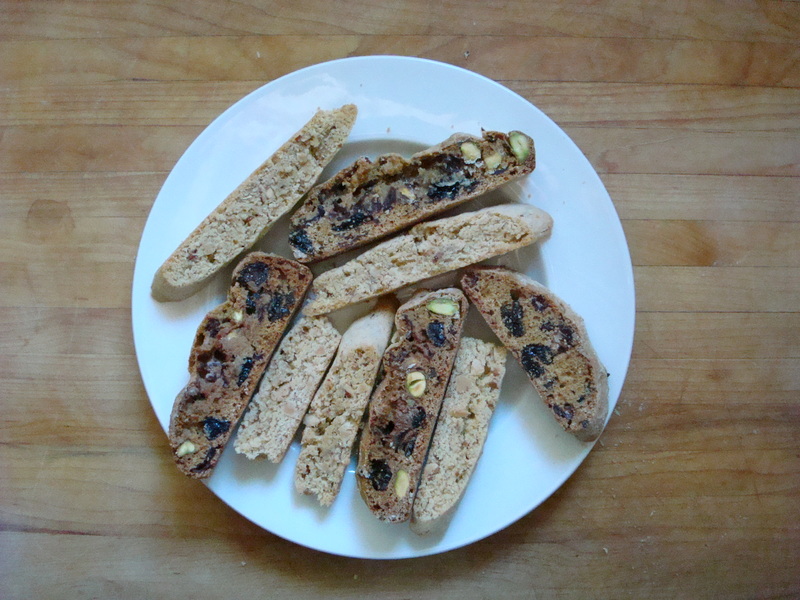 The first recipe I tried was the Gourmet Cookbook’s Dried Cranberries and Pistachio Biscotti. The second is the one I’m presenting here. As scrumptious as these biscotti turned out to be, this recipe contains a number of pitfalls and one important omission. But first things first. Roast the nuts on a small baking sheet until they are fragrant and beginning to color on the inside, about 15 minutes. If using hazelnuts, gather them in a towel, beanbag-style, rub to remove some of the papery skin, and then pick out the nuts. Finely chop 1/4 cup of the nuts; coarsely chop the remainder. In a medium bowl, barely cream the butter with the sugar. Beat in the egg and anisette. In a separate bowl, combine the nuts, flour, cornmeal, baking powder, salt, and anise seeds. Add to the butter mixture and mix until homogenous. Divide the dough in half. Roll the dough into logs about 1 inch in diameter. The dough should be cold enough to handle without difficulty, though you may need to dust the counter with a little additional flour if the logs start to stick. Place the logs on the baking sheet, spacing them at least a few inches apart; they will swell considerably. Bake until slightly brown and firm on the surface, but yielding to light pressure, about 15 to 20 minutes. Rotate the pan if they are browning unevenly. Don’t underbake, or the baking powder will not complete its job, and the cookies will be hard and dense rather than crisp and with a great coarse texture. Transfer the cookie logs to a cutting board and slice on an angle about 1/2 to 3/4 inch thick. Place cut side down on the warm baking sheet and bake for another 5 minutes or so to brown lightly. Cool completely, then store in an airtight container. Variation: Substitute very coarsely chopped raw pistachios for the almonds and grappa for the anisette. I owe a lot of these tips to Sherry, who steered me through the shoals of baking biscotti. Flatten the log of dough a little. It’s strange that Judy doesn’t mention that. Flattening it gives biscotti their distinctive crescent shape when you slice the log of dough after the first baking. The crispness of the biscotti depends on baking the logs completely — not too soon and not too long. Rodgers says the log of dough ought to be firm with a slight spring-back. That direction did not correspond to what I saw and felt. Throughout the first baking, the log felt spongy. I took it out of the oven when the log expanded to the point where cracks began to appear along the top. It still felt soft. My baking times differed by much from Sherry’s cooking times. I had to bake the biscotti about 10 mins longer than the recipe called for. Just keep your eye and fingertip on it. You’ll have to judge for yourself. Don’t overdo the second baking. That’s when biscotti can become teeth-breakers. They should be barely golden toasty. After the first baking, let it cool 10-15 mins before you slice up the log for the second baking. Use a serrated knife and run it under the tap each time before you slice. Hold on to the baked log and very carefully slice through. Remember that the biscotti will harden for a while as they cool both after the first baking and after the second. Regarding ingredients, Sherry recommends Trader Joe’s unsalted roasted almonds. That saves a step. I left out the anisette, but used the fennel (anise) seeds and the flavor came through. Salted butter is important. The biscotti will be bland otherwise. I used an Kitchen-Aid upright mixer with the paddle attachment to mix the batter. This batter was drier than the one I made according to the Gourmet Cookbook recipe. The smaller the biscotti, the easier they are to bake. For the first batch I made, I made logs that resulted in biscotti about 3 to 4 inches long. They required a longer initial bake and still never hardened sufficiently. Judy’s recommendation of 1-inch diamater was too small. If you look closely at the photo, the first Gourmet Cookbook biscotti did not bake long enough in the first baking. Hence, you can see they look a little chewy cookie-like. Baking times in my oven will be what I watch for most carefully.